Painting features high in my recent blogs and so far it’s been portraiture. Scottish and English – brought to the BBC by Peter Capaldi and James Fox. Why, when the $ is under threat (I understand that there is a last minute compromise but may be just till the next Tea Party sally), the dreadful massacre in Norway and the almost forgotten famine and war in the Horn of Africa (I note that a local friend of mine is organising a barbecue for the famine – a sincere thanks to him). In this Global World nothing is totally isolated but all three events are largely self inflicted. James Fox would argue that you can’t separate good art from reality, art has always something to say and to me good art is fascinating to look at – no you don’t need to pay absurd prices for the original – good reproductions convey the essence. So to James Fox’s previous programmes which I watched in reverse order. 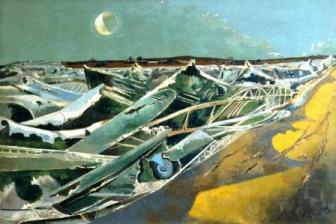 I pick only three examples, Wyndham Lewis, Paul Nash and Stanley Spenser. You may have difficult to see the tiny angular characters representing people at war, raising flags or just sitting in tower blocks. 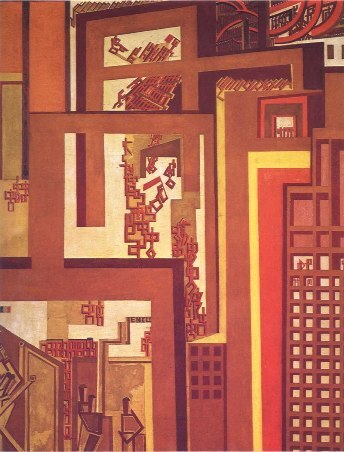 Incidentally you can see more of Lewis at this time in a Vorticist Exhibition in the Tate Gallery in London. 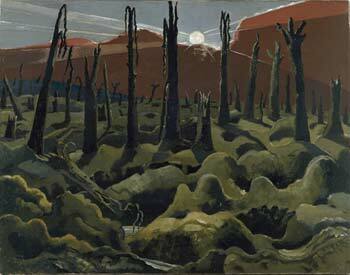 Then Paul Nash – personally I consider Nash as one of the greatest British painters of the twentieth century. He fought in WW1 and was a war artist for WW2 and in between adapted surrealism to the English landscape. 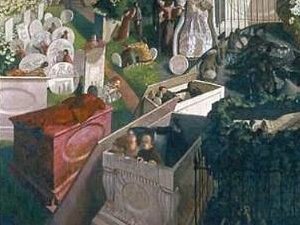 Finally Spenser who depicted the resurrection in Cookham, a village in Buckinghamshire. Fox considers that Spenser was attempting to bring a degree of certainty to Britain after the horrors of WW1. Let’s hope that someone may do the same after some degree of normality returns to the Horn of Africa. Finally back to Capaldi. 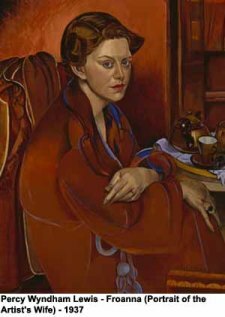 I can’t resist including a late portrait by Wyndham Lewis of his wife and it’s in the Kelvingrove Art Gallery and Museum, Glasgow. Lewis in my view made some of the greatest portraits of the twentieth century and for those who would like to splash out there’s a great catalogue of them published by the National Portrait Gallery of London.